Joy Creek Photo Archive (c) all rights reserved This is sometimes called the Leopard lily of California because of the maroon spots that dot the petals. These are usually concentrated in the interior of the flower which is paler than the recurved tips. The tall flowering stems bear up to ten turkscap flowers. 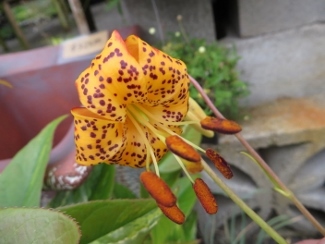 Because in the wild Lilium pardalinum is found in areas with ample moisture, it is important to give it consistent water when growing it in a garden.